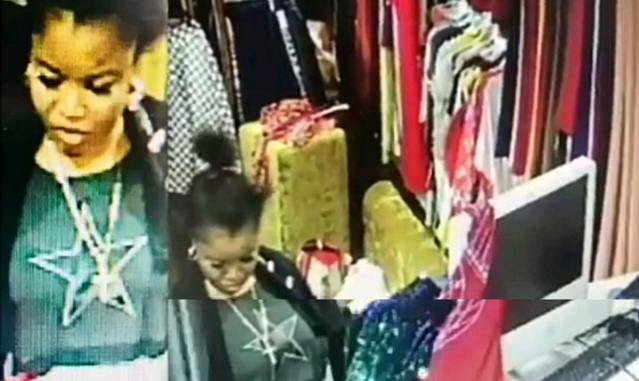 A lady was seen via CCTV allegedly stealing 250k from a boutique in Lekki, lagos State. Hello everyone please whoever knows this woman should give us information on how to get her. She came to our lekki store to steal money from another customer’s bag, after distracting by giving her a dress to try out for her. Please tag people until she’s been exposed and caught. Thank God for our camera that caught her. The money was 250k.From the video you can see the way she dropped clothes on the handbag and took the envelope that contained 250k. She’s the lady on white and black that packed her hair .My dear people please let’s join hand and expose this lady cause she stole the money from a 19yr old girl’s bag. It’s quite painful that a matured lady could steal from a little girl that’s old enough to be her daughter at this economic situation. Pls kindly help us to repost till she gets caught.